Welcome to the fourth edition of Glamour & Grammar, the blog series in which I address grammatical failures in pop culture. 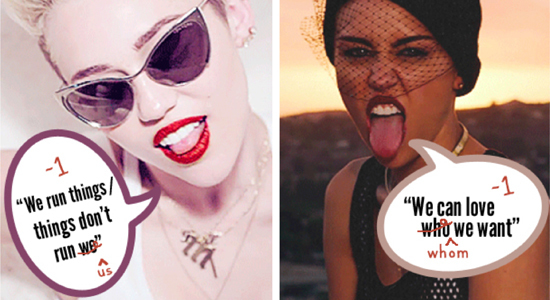 Miley Cyrus is a rebel, and she really really really really wants you to know. In case maybe somehow you still associate her with the Disney Channel, she wants you to stop. Immediately. She has a bleached blond mohawk and a grill. She wears crop tops and mesh almost exclusively these days. She does not do gluten, but she does do lines in the bathroom. She sticks out her tongue a lot. AS IF! Miley Cyrus will switch between singular and plural if she wants to switch between singular and plural. Difference between prepositions and conjunctions? WHO CARES? Not Miley Cyrus. She interchanges like and as on a whim! Ain't nobody got time for that! Especially Miley. You win the Most Grammatical Errors in a Single Pop Song Award, Miley! Way to rebel, you little rebel, you.